SpoiledOnes, do I have some exciting news for those of you in the San Antonio, Texas area! 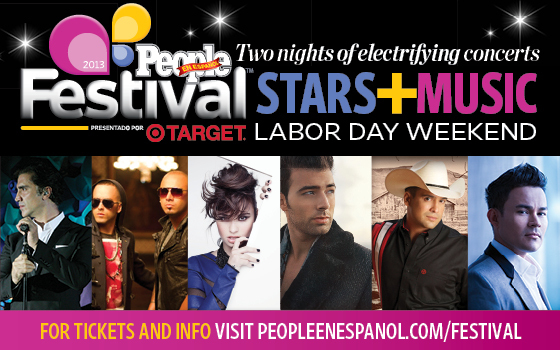 Festival People En Espanol is happening this Labor Day weekend! The festival is a multifaceted celebration of culture, entertainment, and the Hispanic community! This event is Saturday and Sunday and offers free day activities at The Henry B. Gonzalez Convention Center. There will be events and celebrity appearances through out the festival days. This means there will be plenty of activities for you and your little ones to enjoy on BOTH days! But one special event that is happening Saturday, August 31st at 2 pm is the "Latinos in Higher Education: Staying in School and Achieving Success" panel. It will be hosted by award winning journalist Soledad O'Brien and feature commentary from Congressman Joaquin Castro, Pamela Silva-Conde, and Benita Veliz. They are even giving out a scholarship to a lucky San Antonio resident! Then later on both nights of the festival there will be concerts held at the Alamodome. There will be performances including some by Gloria Estefan and Demi Lovato! And guess what #SpoiledOnes I have a promo code that can get you into these concerts for 15% off! Use code PSP15 when purchasing tickets from this site. Don't miss this fun-filled and star-studded FREE event this Labor Day weekend!